Can we talk? We all know that in the past, Office for Mac hasn't necessarily played that well with Office for PC. 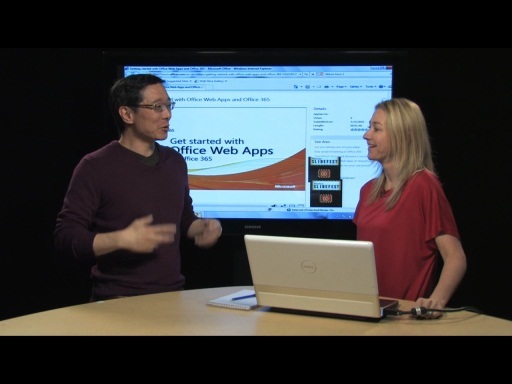 On this episode of The Office Show, we'll show you how that's all changed with Office for Mac 2011. You might not believe this, but around here we don't consider "Mac" to be a dirty word. We like Macs. We like people who use Macs. We want them to have great experiences with Office. But let's be honest, it's been a rough road. Especially when the Mac people spend a lot of time working on their docs and then send them to the PC people, and they end up looking like...well...insert your own metaphor. In this Office Show, Dr. Office, aka Doug "Office Casual" Thomas, shows you how Office for Mac 2011 makes compatibility so much better. Docs made on Macs look great on PCs. And vice versa. Not that we really want to wade into that whole operating-system-as-personal-identification conflict thing, but we think this makes the argument a lot harder. Plus, Mac for Office experts Stephanie Brown and Kurt Schmucker show you some more cool features, like background removal, drag and drop page layout in Word, and reordering in PowerPoint, which lets you open up the layers in a presentation "like a sliced salami." That was fun! I liked the "show" very much. No doubt Microsoft is THE software company. I always wondered why the Mac and Windows versions of Office lacked compatibility that much, given the fact that Microsoft is writing the software. Well done making them compatible. Please say that Office is coming for iOS devices in the near future. I love Office 2011, all I need now is OneNote on Mac! Please Microsoft make it happen. OMG why make mac office better than Windows office? Surely Windows 7 is just as capable of doing the same stuff a mac can? @ahead:That's exactly what I was thinking. Does increased compatibility mean: We have features that are available on the Windows platform only, but now, we also have features that are available on the Mac platform only. Although I like the show. It's funny and entertaining. It's just that I understand now that compatibility might get more difficult in the future. Maybe it's a good idea to synchronize release dates and features for Windows and Mac. I don't think microsoft will stoop to their level, also microsoft doesn't have monopoly on pc's. And since a MAC technically is a pc it wouldn't make any sense. It's like saying TOSHIBA vs. PC, it doesn't make sense since TOSHIBA is a PC and you can install any of the different Operating systems on it, (and all if you have a big enough harddrive).